Syria’s example illustrates the challenges of gathering good economic data during conflict. 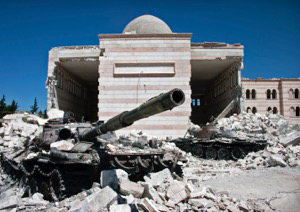 Two destroyed tanks in front of a mosque in Azaz, north of Aleppo. Photo taken in August 2012 by Christiaan Triebert. Although the frequency of civil wars has fallen in recent decades, civil conflict in the Middle East has become ever more prevalent since the Arab Spring. A number of nations, including Syria, Tunisia, Libya, Iraq and others, have experienced either civil war or low-intensity civil conflict. The conflicts have made it difficult to measure the economic growth of these countries. In this example, we will use the case of Syria to demonstrate how the problems that stem from civil conflict affect both the population and the GDP, the two key figures to establishing the wealth of a country. We consider GDP per capita to be the measure of economic performance, with GDP per capita growth rate signifying economic growth. Yet these two statistics—overall wealth and the population that wealth is spread among—become significantly harder to obtain. The civil war in Syria, which began in 2011, has created utter chaos for international institutions that measure population. Prior to the conflict, the United Nations Department of Economic and Social Affairs performed this task. However, the increasing violence has created a need for more funding, and thus the European Union commissioned a population study on Syria. Due to risks stemming from the civil conflict, these institutions are restricted in their abilities to sample populations in certain areas. In more extreme cases of civil war, they are unable even to have personnel on the ground. Needless to say, this impedes accurate measurements of the population. And keeping that count up to date matters because war causes rapid fluctuations in population. Prior to the conflict, the population of Syria in 2010 was put at 20.7 million. Since then, approximately 4.8 million people have fled to other countries and 7 million more have fled their homes as domestic refugees, making it difficult to determine the population of the country. Estimates of the population after the conflict range from 16 million in 2014 to 18.8 million. The war has also created drastic changes in the birth and death rates, significantly affecting demographics. Measuring the GDP of Syria—or any war-torn country—presents many of the same problems as measuring the population. The international institutions that try to measure GDP must quantify the value of the country’s output at a given point in time. In 2010, the GDP of Syria was measured at $60.5 billion, according to the UN. Estimates of the GDP in 2014 approximated $34.2 billion. These fluctuations make it more difficult for institutions to provide accurate estimates of GDP. In addition to being extremely volatile, war-time GDP is often highly dependent on fast-changing factors such as foreign aid or destruction caused by the conflict. The GDP of Syria before the battle in Aleppo, for example, may very well be significantly different from the GDP after the battle due to the destruction of property, infrastructure and the reduction of new goods and services. What’s more, military spending in a conflict warps GDP as a measure of the economic well-being of the populace—the true meaning of economic performance. The current Syrian GDP relies heavily on military spending and foreign aid. In 2012, the United States sent $107 million in aid for various humanitarian purposes. This aid does not include the value of the weaponry sent to arm the Syrian Free Army and other rebel groups. Similarly, Russia has sent the Syrian government immense amounts of aid in the form of weaponry and advanced military hardware. Yet clearly, the civil war has led to the deterioration of consumption and services for most people and the military spending and foreign aid do not compensate in terms of economic performance. In essence, civil conflict causes the GDP of a country to consist more of military spending and other spending that does not contribute to or indicate economic well-being of the people. It is important to be wary of the estimates of economic growth for countries suffering from civil conflict. The GDP per capita of the country may not provide an accurate measure of the country’s economic performance for multiple reasons. In general, civil conflicts prevent institutions from being able to accurately measure important statistics and create so much volatility that the measurements are likely to be inaccurate.